You can custom-configure your BVI Business Company in any way you need! Please use our Order Form to request a precise quotation from us. Completing the Order Form does not bind you to make a purchase. We offer a flexible discount system, depending on the scope of services ordered. Go to the Order Form here! (!) The bank account introduction is not included in this package. We recognize that many clients will prefer to open bank accounts with their own bankers, in jurisdictions of their own choice. Our professional fee for a bank account introduction starts at $925. Please note that when we act as director, we are to sign as either sole signatory or joint signatory on all of the Company's bank accounts. A number of selected offshore banks is available. (!!) When we act as director disbursements and execution fees may apply. BVI Business Company formation and all primary documents. The company registration fee to the BVI government. A set of copies of the primary documents certified by Notary and Apostille for international use. This package is designed for those lucky individuals, who live and work in a country where they can afford to be seen as directly owning and managing their own offshore company. This setup presumes a direct, hands-on operation of the IBC by the company owner. (!) Note - if you live in, or bear a passport of a high-tax country with an aggressive and efficient tax revenue service , this setup may be unsuitable for you. The annual administration fees for this package, starting from the second year: $980. This includes the $450 BVI government, mandatory registered agent service and compliance fee for KYC review and update. (!) The bank account is not included in this package. We recognize that many clients will prefer to open bank accounts with their own bankers, in geographical proximity to their area of operation. If required, our professional fee for a bank account introduction starts at $925. A number of selected offshore banks is available. BVI Business Company formation, all primary documents and corporate seal. Business administration service for one year. Shareholder service for one year, provided by a BVI-based, licensed firm. Corporate directorship service for one year, provided by a BVI-based, licensed management firm. A comprehensive, "bullet-proof" package. It includes our in-house professional directorship, secretarial and business administration service, plus the shareholding service for enhanced confidentiality. The business administration service includes a BVI street address and fax number for the company, handling of commercial documents and correspondence, and a basic consultation for one year. This package comprehensively deals with the most crucial tax planning question: "by whom, and from where is the company actually managed?" In this setup, the company can demonstrate that it operates "at arm´s length" from its actual owner – as opposed to being technically operated from the owners´ home. This package is designed for the most demanding business engagements - for those clients, who can not afford to cut corners. The annual management fee for this package is $2280, starting from the 2nd year. This includes the $450 government annual license fee, registered agent, compliance fee for KYC review and update, licensed director, shareholder and secretary, business administration services and basic consultation for 12 months. Company formation and all primary documents. Corporate directorship service by a local, licensed service provider. Business address, correspondence & document administration. A set of primary documents, notarized and legalized by Apostille. Limited General Power of Attorney, Apostilled. International Foundation Council Member service by a local, licensed service provider. Original Certificate of Establishment of the Foundation, notarized and legalized by Apostille. The annual management fee for this package is $2780, starting from the 2nd year. Many choose to incorporate an offshore company which subsequently is owned by a foundation. Here the Belize foundation would be used to hold shares in a BVI BC. This way one can get the protection and continuity offered by the foundation and in the same time - engage in commercial activities. Useful to know, that Belize Foundation can be established having charitable or non-charitable purposes. There are rather similar functions and reasons for establishing a Foundation or a Trust, the difference is the legal structure. The main difference is that Trusts historically originate from common law countries, e.g., England, USA and India, therefore are mainly used by these countries. While Foundation is a product predominant and understandable by the Civil law countries, e.g., France, Germany, Russia, Spain. In reality one can even say, allegorically, that Foundations are Trusts for the countries who do not understand Trusts. For more complex structures, additional Belize, Seychelles or BVI companies can be formed under the same Foundation at additional fee. Annual fee for the provision of Trustee. Government Fee for registration of a Belize International Trust. Annual fee for provision of Trust Agent. Original Certificate of Registration of the Trust, notarized and legalized by Apostille. The annual management fee for this package is $2830, starting from the 2nd year. Much higher asset protection is best achieved when an IBC is used in combination with an offshore trust. Here the Belize trust would be used to hold shares in a BVI BC. This way, a legal additional level of confidentiality is achieved. Useful to know, that Belize Trust can be established having charitable or non-charitable purposes. For more complex structures, additional Belize, Seychelles or BVI companies can be formed under the same Trust at additional fee. General Power of Attorney, Apostilled. Government Fee for registration of a Seychelles International Trust. Copy of the Original document of the Trust Registration, notarized and legalized by Apostille. Much higher asset protection is best achieved when an IBC is used in combination with an offshore trust. 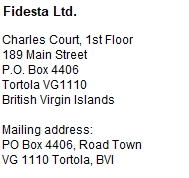 Here the Seychelles trust would be used to hold shares in a BVI BC. This way, a legal additional level of confidentiality is achieved. Useful to know, that Seychelles Trust can be established having charitable or non-charitable purposes. As an absolute minimum, a new BVI BC formation would involve the one-time legal work to establish the offshore company, the payment of the appropriate registration fee to the BVI government and the provision of the mandatory registered agent service for the company in BVI and mandatory filing of the Register of Directors to the Registry. Please note that due diligence document review for the first three persons is included in the initial company formation, when company configuration consists of more than three persons, due diligence review and approval is charged per each next person, and minimum charge is USD 250. For further information as to how offshore companies are usually constructed and which services may work for you, there is plenty of useful information in the Company Management and Offshore Knowledge Base chapters in this website. If that information still does not seem to answer your questions, please contact us with your question! Our full price-list is available for download here! If you are a professional (intermediary) and require offshore incorporation services for your clients on a regular basis, please contact us for our special rates for professional intermediaries.